freezer | EASY AS PIE! 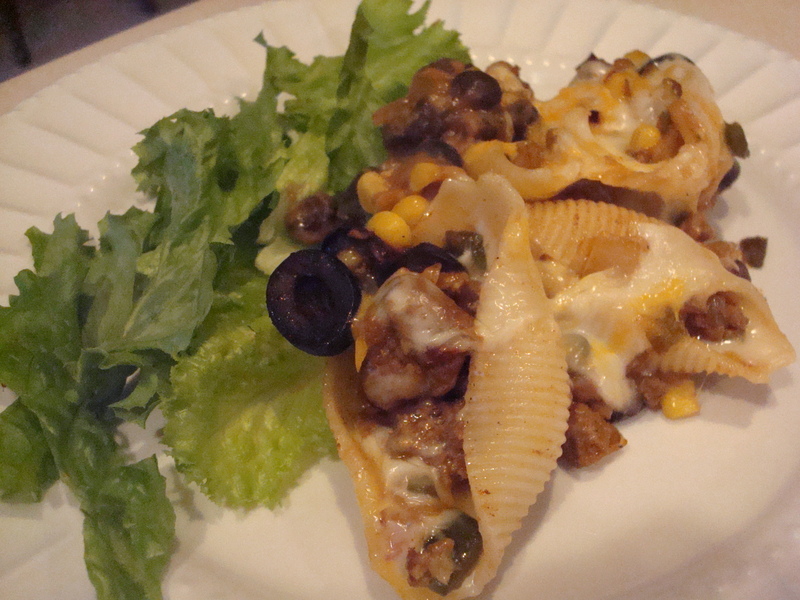 I was planning on making my Beef Taco Bake one night, but at the very last second I decided to use pasta shells instead of hard tacos shells. It was a good decision! But, I totally confused Tim. He had asked earlier in the day what was for dinner and I told him the taco bake and when I served him the stuffed shells, he was very confused. Anyway, we enjoyed them very much and I stashed 1/2 in the freezer for a night when I’m short on time. Just a note about freezing meals that is probably common knowledge already but oh well. Cover the dish with plastic wrap and write the date, item name, and baking directions directly on the plastic wrap with a sharpie, then cover with a layer of foil and place in the freezer. That way, the directions are on the meal and you don’t have to guess about the baking instructions in a few months when you (or your husband 😉 ) pull it out to prepare for the night. Just one note on something I’ll change next time. I thought it could have been just a little saucier, so I’ll add some salsa (maybe 1/2 cup) to the mixture before stuffing the shells next time. 1. Adjust oven rack to upper-middle position and heat oven to 375 degrees. Combine refried beans, black beans, and hot sauce in a bowl. Spread evenly in two 8 or 9- inch square baking dishes (0ne for now and one for the freezer). Sprinkle with 1/2 cup cheese per baking dish. 3. Meanwhile, cook beef in large skillet until no longer pink with onion, peppers, and garlic. Pour off fat. Then stir in taco seasoning and water. Simmer over low heat until thickened. 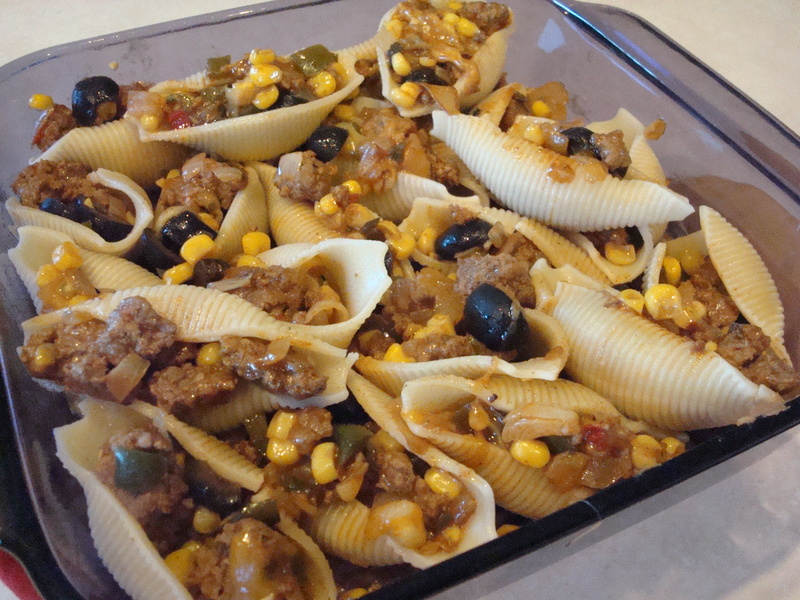 Then stir in Mexi-corn and olives and turn off the heat. 4. Spoon the beef mixture into the cooked and drained pasta. Arrange in the baking dishes. Cover with with foil, and bake until bubbling, about 20 minutes. 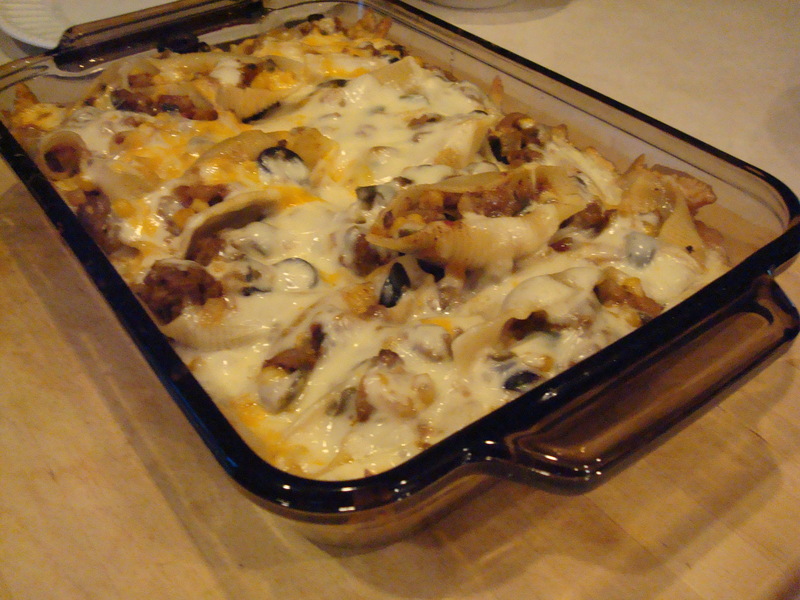 Remove foil, top with remaining cheese, and bake another 5 minutes or until cheese is melted. Sprinkle with scallions and/or shredded lettuce and serve with sour cream on the side.